This entry was posted in Blog News and tagged Blogging, blogiversary, Book Club Babe by Book Club Babe. Bookmark the permalink. I just read your Nicholas Sparks post and you’ve completely validated my decision to not read another of his books every again (I read The Notebook and that’s it). Congrats on blogging for five years – I don’t know how we haven’t crossed paths sooner as The Other Watson is one of my blogging buddies from when I first started too! Anyway, here’s to another five years and this post, one day, being classified as “ancient”. Thanks! Glad I prevented you from more torture! And what a small world–love meeting blogger friends of friends! 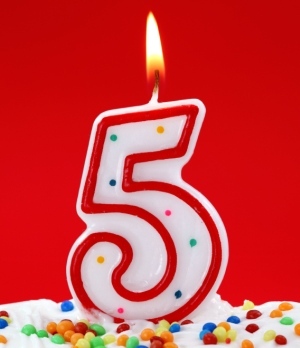 Congratulations on 5 years blogging! Thanks and congrats to you as well!